Belfast bantamweight Michael Conlan secured a gold medal at the European Championships in Bulgaria by beating British boxer Qais Ashfaq in the final. Conlan produced a dominant display and was awarded a unanimous points decision by the three judges after three rounds. Two of the judges scored the contest 30-27 in Conlan's favour, with the third scoring the fight 29-28. The fight was a rematch of the Commonwealth Games final in Glasgow last year, which Conlan, 23, also won. 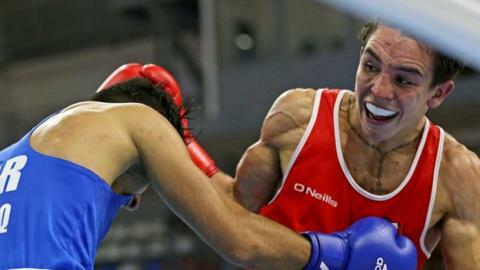 The Irish boxer had reached the final by seeing off Francesco Maietta by another unanimous decision in the semi-final. Another Irish boxer, light-heavyweight Joe Ward, beat Peter Mullenberg of the Netherlands on a unanimous decision to regain the European title he won four years ago.